November 19,2014. 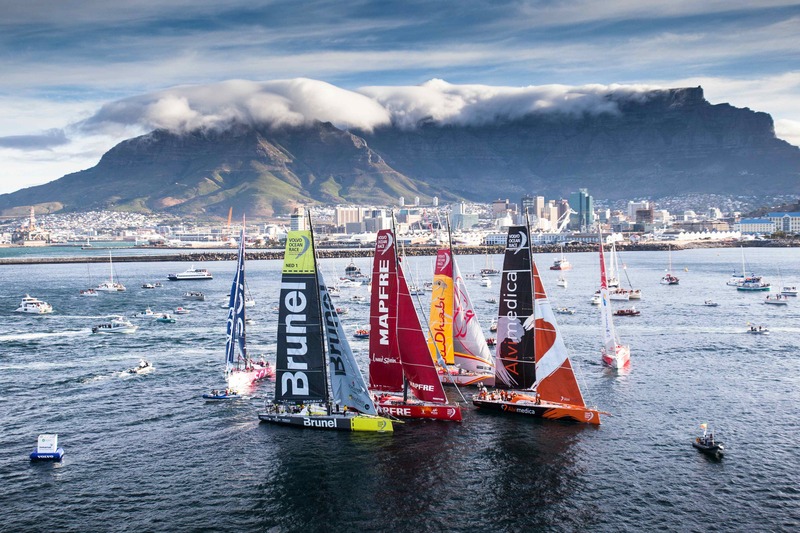 The fleet during the start of Leg 2 in Cape Town. Sunset+Vine, the UK-based TV sports production and media company which is part of the Tinopolis Group, has returned as the exclusive global distribution agency for the Volvo Ocean Race 2017-18. The agreement, which begins with immediate effect, will run for the duration of the 2017-18 edition, which starts 22nd October from Alicante, Spain. Sunset+Vine is a world-leader in sailing TV production. It has a long history with the Volvo Ocean Race spanning three Host Broadcaster appointments. In addition, the company has worked on the world’s most well-known sailing events producing the BBC’s Olympics coverage (Rio 2016 + London 2012); the America’s Cup for BT Sport and BBC in 2017 and the World Sailing Olympic Classes World Championships in 2011 and 2014. 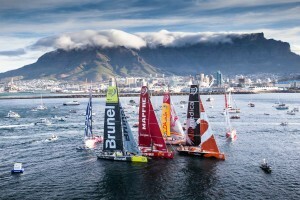 It also produces the popular monthly grand prix sailing series “The World Sailing Show” as well as “Mainsail” for CNN. The television programming will feature 9 x 30-minute shows over the course of the 2017-18 edition, plus pre-race and post-race one-hour specials. Digital livestream coverage will be provided for each Leg Start, Leg Finish and the In-Port Races featured at the Host Cities with up-minute digital updates from Volvo Ocean Race HQ in Alicante, Spain. Sunset+Vine will be responsible for driving its distribution to broadcasters worldwide as well as capturing new audiences through a digital-first approach. Leon Sefton, Head of Television, Volvo Ocean Race, comments: “We’re committed to showing the raw emotion of the race through our television and digital coverage. This is the ultimate test of a team and an incredible human drama, played out over eight months in a harsh, unforgiving environment. It pushes people physically and mentally, and ever since the first edition in 1973-74 winning it has been an obsession for some of the world’s best sailors. Our goal is to reveal the extraordinary effort it takes to accomplish that victory. “Our television programming will be focused on high-end storytelling but the instant updates, inside looks and day-to-day drama will be available via digital content that will provide viewers more immediate and on-demand access to the stories as they unfold. Today’s viewer wants to see sports action when they want it: on the go, on their smartphones with the ability to share via social media.” Andrew Piller, Commercial Director at Sunset+Vine adds: “The Volvo Ocean Race offers the best opportunity in the world to capture the footage and stories from the oceans. It delivers adventure sports programming like few other sports properties out there. For its part, Sunset+Vine helped the Volvo Ocean Race reach a record level of TV publicity value (293 million euros) in 2014-15 through broadcast news, programming and video clips as measured by Repucom, the official research and tracking company in the last edition. This edition brings a significant change in the race’s use of Onboard Reporters (OBRs) – the embedded journalists who work around the clock to capture, edit and transmit the multimedia material that features in the spectacular TV programming and fuels the real-time digital and social updates that fans crave. In the past the teams have appointed their own OBRs but for 2017-18, the Volvo Ocean Race is creating a pool of these professional storytellers and assigning them to teams on a leg-by-leg basis – creating an option to rotate them across different boats. Another important innovation for 2017-18 is the introduction of the Crew Communicator, a device that will allow the sailors to supply their own digital updates, including photos and short videos, direct from the oceans. That follows a rule change from the race, which had previously banned Internet access to the teams in order to rule out any potential outside assistance from shore.